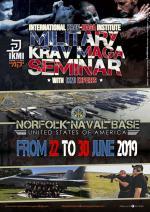 The International Krav Maga Institute is developing comprehensive training programs through courses, Intensive courses, workshops on the use and practice of krav maga with civilians and private specialized training to police, armed forces and security operators. 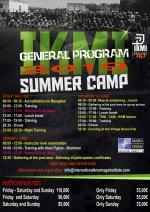 IKMI is an organization dedicated to the study and development of Krav Maga and Israeli Combat & Tactical Shooting. 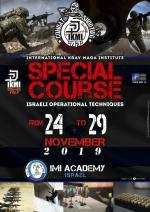 The courses are directed by Military Instructors, experts in israeli tactical shooting and operating techniques. 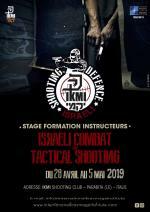 krav maga, which means « close combat » in Hebrew, is a self-defense method developed in Israel in the 1930s by Imi Lichtenfeld. Originally created to protect the Jewish community in Bratislava after the First World War, it was quickly adopted by the IDF and Mossad, and subsequently many polices and elite troops in the world. Based on natural movements, Krav Maga does not require a specific physical preparationand and is in relative interest among civilians due to its speed of learning. This simple method, based on reflexes and rapidity of action, is aimed at both men and women. Ikmi is also present in various countries around the world. Unique event not to be missed - limited places! Début du stage le 5 Avril à 14:30 - Fin du stage le 8 Avril à 19:00 - Départ le lendemain matin.